If you have invested in property in Delhi’s not-so-distant neighbour, Noida, there is reason for you to cheer, claim real estate agents. Following the Allahabad High Court ruling that reinstated Noida’s status as a district, property prices have been shooting up in this industrial suburb adjoining Delhi. It is strange that out of 41 night shelters all over Delhi, there are only three such shelters for the destitute of East Delhi despite the fact that a large population of Delhi resides in the Trans-Yamuna areas. The North district police today claimed to have arrested two autolifters and recovered two motorcycles and a Maruti car from their possession. Two button-actuated knives were also seized from them. Only 590 people are born in the national Capital every day, but as many as 800 arrive in the city multiplying its population at an alarming rate. The Union Urban Development Secretary, Mr Anil Baijal, today said that a convention centre would come up in Dwarka. The convention centre will be supported by facilities such as hotels, multiplexes and entertainment outlets. There has been a drastic change in the telecom sector, hitting the once-lucrative business of a PCO owner who is now looking for other alternatives to earn his bread and butter. With the pictures of horror of the tsunami terror, which ravaged the Southern coastal region of the country recently, still freshly etched in the minds of the public, what could be better than starting off the New Year by paying tributes to nature and the seasons? The National Museum will host a number of meetings to preserve the national heritage of the country. The meetings will be held from January onwards. District election chief Anurag Aggarwal today stressed that even those who cannot be issued a photo identity cards on time will have an opportunity to cast their votes. Traders across the country will observe January 5 as Black Law Day in protest against what they termed as the ‘illegal’ levy of service tax on transportation of goods. The Global Meet of the Alumni of Indian Institute of Technology, Roorkee, was held today at Hotel Taj Palace. The focus of the meet was on strategic networking and empowerment of the nation by synergising the resources. A 15-day National Workshop on Interactive Multimedia for faculty of the open universities and the correspondence course institutes will be organised in the Capital with the objective of developing and transforming the existing course materials of various disciplines. To buttress their claim, dealers say that developers paid as much as four times the highest bid at the latest land auctions by the state government, compared to what had been paid just two years ago. At the Sector-18 commercial zone, the rates being quoted at present for a square metre of land hover between Rs 2.32 lakh and Rs 2.95 lakh, the highest in the National Capital Region. Interest among the real estate developers in grabbing land in Noida is also driven by the infrastructure development envisaged in the future, with the Commonwealth Games scheduled to happen in the near future. The maximum benefit of the developments coming with the Games is expected in the Trans-Yamuna area of Delhi, particularly in Mayur Vihar, Patparganj and Noida. In addition, the extension of the Metro Rail project to Noida is being seen as another reason that could lead to escalation in land prices, a developer said. The Metro Rail project, in its second phase, would be coming up to New Ashok Nagar in East Delhi and this line would then be further extended up to Noida. The promises of development have caused an escalation of prices to the extent that a two-bedroom flat, which cost between Rs 14 lakhs and Rs 15 lakh till about a year ago, now costs nearly Rs 20 lakh. It was pointed out that there are indications of further increase in land prices in Noida and Ghaziabad. With known names in the development business showing interest in Noida, the real estate agents predict a boom. Most of such hapless people are thus forced to sleep in the open at night, even in winter. The three night shelters at Shahadara, Nand Nagri and Trilokpuri get over-crowded as darkness falls. They can hardly accommodate as many as 150 people. The rest of them have no option than to sleep on footpaths, in front of shops and in the open. The president of a social service organisation, Indian Philanthropist Trust, Mr Brij Mohan Aggarwal, who is running such a temporary shelter in Laxmi Nagar, said that the number of destitute people is maximum in East Delhi. Keeping this harsh fact in mind, the government should construct at least 15 additional night shelters, he said. Giving an account of such shelters, Mr Aggarwal said that when Aruna Asaf Ali was the Mayor of this city in 1958, while passing through Chandni Chowk one night, she saw some rickshaw pullers sleeping on their rickshaws in the cold night. She was so concerned that she decided to do something for them. She then met the then Prime Minister Pt. Jawaharlal Nehru who agreed to the proposal of three night shelters at Asaf Ali Road, Old Delhi Railway Station Road and Edward Road. The shelters were constructed the same year. However, for want of proper maintenance, the condition of the shelters has become deplorable, Mr Aggarwal lamented. “Since then, the Delhi government has constructed more than three dozen night shelters. 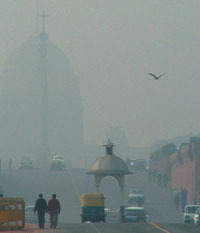 However, East Delhi has been given the cold-shoulder,” Mr Aggarwal recalled. Other social workers of the area have also echoed the same sentiments and repeatedly demanded the construction of such facilities, especially in view of the fact that the Trans-Yamuna area has its own development board. After an unusually warm New Year day, the mercury in the Capital today fell sharply while the fog disrupted the air and train traffic. After sparing Delhiites for a few days, fog returned forcing the railways to cancel some of the trains while delaying the movement of some others. The operation of flights came to a grinding halt at around 7 am with the Runway Visibility Range (RVR) falling to 120 meters. The visibility went down to 75 meters late. However, the air traffic was normal late last night and in the early hours of the day. The movement of trains from and to the Capital continued to be affected by fog. A number of trains were running several hours behind schedule. Trains cancelled include the Delhi-Sealdah ‘Lal Quila Express’ and Delhi-Farukhabad ‘Kalindi Express’, the Railways said. Many of the trains were also running behind schedule. These include the ‘Mahananda Express’ and ‘Saryu Yamuna Express’. Domestic flights were also disrupted because of the fog, though no cancellations were announced. Both Jet Airways and Sahara said many of their flights, particularly the early morning, had been delayed by 2-3 hours. Meanwhile, the weather department said the minimum temperature dropped to 9.0 degree Celsius from 13 degree Celsius recorded yesterday. During a special checking, the police noticed two persons on a motorcycle coming from the Wazirabad side and when questioned about the papers of the vehicle, they admitted to have stolen it from the Adarsh Nagar area. They were identified as Saleem (20) and Imran (20), both residents of Jahangirpuri. They also disclosed that they had stolen one motorcycle from the Samaipur Badli area and a Maruti car from Shalimar Bagh. The police have recovered both the vehicles from their possession. In another case, with the arrest of five criminals, the North-East district police has claimed to have foiled a dacoity attempt in the bus route No. 982 near Dhobi Ghat, Welcome. They were identified as Chand, alias Chanda, Yusuf Pakistani, Dilshad Shubrati, Mohammad Illiyas and Akbar Ali, all residents of Welcome area. The police also seized weapons from them. A fire broke out in a foam godown at Shahdara in East Delhi this morning. However, there were no casualties. The fire department sources said that a call was received at around 10.35 am regarding fire in a godown. At least 15 fire tenders were immediately rushed to the spot. The blaze was brought under control at around 11.35 am. Despite a decline in birth rate, the rise in population has also been boosted by a decline in death rate, according to the Annual Report on Registration of Births and Deaths of the Delhi government. The birth rate went down from 23.58 births per thousand during 2002 to 21.24 births per thousand during the following year while the death rate came down from 5.93 per thousand to 5.81 in 2001. The average number of births per day in Delhi was 869 during 2000 and 812 in 2001, whereas the average number of deaths per day in 2000 was 219 as compared to 222 in the following year. About 222 deaths take place in Delhi per day as compared to 812 births resulting in an increase of 590 people daily and 2.15 lakh in a year to the city’s population. The remaining increase of 2.70 lakh in population is because of migration. There has been a decline in the birth rate of females as compared to males. There were as many as 820 female births per one thousand males in 2000 as compared to 809 in 2001, the report said. The report shows that the rate of literacy had a great impact on the size of families in the Capital. Only two per cent of the women who were graduate or postgraduate had four or more children as compared to 15 per cent of illiterate women who had equal number of children. It also found that Delhi women in the age group of 25-29 were most fertile, sharing 41 per cent of total births. Those in 20-24 age group followed next with 32 per cent of the total births. The 15-19 age group was least fertile, accounting for only two per cent of the total births. According to the report, about 62 per cent of the births registered in Delhi took place in institutions during 2001 as compared to 61 per cent in 2002.
been engaged to take the job further. He said that four to five locations are being considered for waste management to maintain a clean look of the city. Facilitating public-private participation has become the need of the hour to deal effectively with this issue, he added. the building bye-laws by modern, well-qualified architects. He stressed the need to regularise the sanctioning of the building plans through registered architects and structural engineers’ certification. At a meeting held with the senior officials of the BSNL, the largest service provider of telecom services in the state, the PCO operators asked the authorities concerned to take action to solve their problems. The PCO owners have demanded an increase in the commission offered for the calls made through them. There are about 2,000 PCOs in the entire district, of which as many as 1,500 are located in the urban areas. It is learnt that at least 1,000 PCO booths have surrendered before BSNL due to various reasons in the last two years. According to Mr J. B. Verma, general secretary of the Faridabad STD PCO Holders Welfare Association, the loss of income is due to various reasons. The entry of private phone companies had led to this development and it was a fact that one could not survive entirely on the PCO work. The PCO business was gainful a few years ago, he claimed. Nowadays, the PCO operators are given a raw deal. As far as commission is concerned, the operators are given a very low commission. Due to this, the business is suffering during the last few years. He cited another reason about the loss of business—lowering of the STD and ISD rates, facility of the STD cards and the increased use of mobile phone, had also caused a grim situation for the PCO business. As now, only those persons who have no access to the STD and mobile phones come at the PCOs.. He said the condition of the minimum billing of Rs 1,600 per month by a PCO is becoming unbearable for many due to slump business and the BSNL has failed to accept their demands for lowering the minimum bill to Rs 800 so far. Moreover, the facilities and services of the BSNL are not up to the mark and this has made many people to switch over to the private phone companies, as the service like the fault repairing and attending to complaints are much fast and efficient. Rajkumar, a resident of Ajronda village, who has been in this line for the last few years, claimed that poor service of the BSNL had made him surrender its PCO connection and switch over to the work of a private company, about two years ago. He also claimed that the earnings and the profit margin of an operator had declined steeply and it is not possible to bank upon this type of work only. The General Manager of the BSNL here, Mr R. C. Hooda, assured the operators in the meeting yesterday that their demands have been taken up with the higher authorities. Meanwhile, the PCO Operators’ Association handed over a cheque of Rs 11,000 towards the Relief Fund of the tsunami victims. Still Alive Khajraho by Rajinder Kumar Wadhwa. With the pictures of horror of the tsunami terror, which ravaged the Southern coastal region of the country recently, still freshly etched in the minds of the public, what could be better than starting off the New Year by paying tributes to nature and the seasons? The Anant Art Gallery here is doing just that by holding an exhibition of small works on paper by some of the well-known contemporary artists from January 8 to January 17 at the Shridharani Gallery, Triveni Kala Sangam. Appropriately titled “Ritu: A gathering of Seasons”, the exhibition will have on view works of some of the well known artists like Manjit Bawa, Saira Wasim, Amit Ambalal, Kirpal Singh Shekawat and Wasim Ahmed among others. Along the sidelines of the exhibition will be a Bharatnatyam recital by Malavika Sarrukai, poetry recitation by Ashok Vajpeyi and Dr, B. N. Goswamy and a round table discussion between the participating artists and Dr B. N. Goswamy, who is also curating the exhibition. The Indraprastha Art Gallery in Madhu Vihar here exhibited the works of four young photographers under the banner of “Expression of India” from December 22 to January 2. The four photographers whose works were exhibited are Rajinder Kumar Wadhwa, Shabir Hussain Santosh, Malkiat Singh and Sandeep Goswami. The young photographers have attempted to capture the expression of the diversity of the country through their lenses. The Academy of Fine Arts and Literature here also showcased the photographs of the well known photographer, Anshuman Sen. This was the photographer’s second solo exhibition. The Art Alive gallery is holding an exhibition of paintings of two contemporary artists, Manish Pushkale and Kanchan Chander. The exhibition is on till January 6. Vatayan Arts is showcasing the paintings of Bala Sharma, a well known artist in an exhibition, which will continue till January 17, while Ashok Hotel is holding an exhibition of the paintings of Jasbitr Bawa till January 5. For the film buffs, the Italian Cultural Institute here is offering some of the Italian classics beginning January 5. Among the films, which the institute plans to screen beginning January 5, are Amarcord, Morte a Venezia (Death In Venice), Primo Amore (First Love) and Un Te’ Con Mussolini (Tea with Mussolini). For the benefit of those who do not understand Italian, all the movies will have sub titles in English. The special screening of the Italian Classics will conclude on March 30. According to the Director-General of the National Museum, Dr K. K. Chakravarty, “The museum is planning to hold meetings with all the museums across the country. The first meeting will be held in Imphal and the second will be in Kolkata. The third and the fourth meetings will be held in Bangalore and Orissa respectively.” Cataloguing of artworks and their conservation will also be discussed in those meetings. Several communities, who are playing a key a role in protecting the artworks in keeping the national heritage intact, will also take part in the meetings, Dr Chakravarty added. It will also create an awareness about the documentation and revitalisation of artworks for further protection. “We are also planning to expand the museum so that more works of art can be displayed and talks are underway with some corporate and government agencies in this regard”, Dr Chakravarty said. The exhibitions at the museum have always been special attraction for the visitors. However, the 2005 calendar is chockfull of exhibitions, including the exhibition on Gupta Empire, which will showcase the masterpieces of sculptures from all over India. Other exhibitions will be on the ‘Arts of Mathura’ and another on ‘Roman Civilisation’. National Museum not only attracts visitors from India but also for foreigners the museum is a major attraction. Bhimbetka, the Vindhyan range in Madhya Pradesh in central India, has been recently declared as a World Heritage Site by the UNESCO for the importance of rock art in India. The Indira Gandhi National Centre for Arts (IGNCA) has organised an exhibition on rock art of India. The exhibition, which showcases the works captured by the Indira Gandhi Rashtriya Manav Sangrahalaya (IGRMS), has begun on December 23 and will on display till January 3. The exhibition is showcasing the traditional arts of rock paintings, fiber replica of rock art, mainly from Madhya Pradesh. The photographic exhibition provides a comprehensive array about the lives, beliefs and expressions of early man. The photographs contain figures of hunters, dancers, drummers and animals. Besides the artworks from Madhya Pradesh, paintings of other rock art sites in India, like Rajasthan, Gujarat, Goa, Kerala, Karnataka and Orissa, are also being displayed in the exhibition. 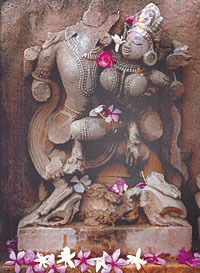 The IGNCA provides a platform for the presentation of the arts in India. The IGNCA is also showcasing a Kashmir Crafts Expo. It displays the work of the craftsmen of Kashmir. Their products include the famous pashmina shawls, ponchos, stoles, carpets and wooden items. The Kashmir hotel and restaurant association, house-boat owners association have also participated in the exhibition. A Kashmir crafts fair will be held in Chandigarh in the coming month. District election chief Anurag Aggarwal today stressed that even those who cannot be issued a photo identity cards on time will have an opportunity to cast their votes. Those who are without the photo I-cards can cast their votes by producing certain documents specified by the Election Commission. The documents are essential to establish their credentials. According to the official version, more than 90 per cent of the voters have been issued the I-cards. Mr Aggarwal said that the voters’ list will be displayed on the notice board in the mini-secretariat, at the tehsil office etc. tomorrow. This will enable those whose names have not been incorporated in the list due to some reason to be included all the same after affected persons brings its to the notice of the authorities. He appealed to the public at large to cooperate with the authorities and ensure smooth and fair conduct of the elections. Traders will adopt a resolution on that day not to accept the levy of service tax, which was “contrary to the letter and spirit of the Finance Bill 2004”, Confederation of All India Traders Secretary General Praveen Khandelwal said in a statement here today. Mr Khandelwal said the traders will organise dharnas in capitals and districts of all states and also take out a protest march with a demand for withdrawal of service tax from the trading community. The Centre put traders under the service tax net through a notification issued on December 3, he added. He said the traders have sought an appointment with Finance Minister P Chidambaram and the Chairman of the Central Board of Excise and Customs to lodge their grievances in the matter. ‘’If our demand is not accepted, the traders will go for a further nation-wide agitation and, if necessary, will go to the court of law to get justice,’’ he said. The Global Meet of the Alumni of Indian Institute of Technology, Roorkee, was held today at Hotel Taj Palace. The focus of the meet was on strategic networking and empowerment of the nation by synergising the resources. The meet was organized by the National Capital Region chapter of the IIT Roorkee Alumni Association under the leadership of Er R K Singh, Chairman, Railway Board and 1966 alumni of the Institute. The Lt-Governor of Delhi, Mr B L Joshi, was the chief guest on the occasion. Among other dignitaries present were Prof Prem Vrat Director of IIT Roorkee, Er Pradip Baijal, Chairman TRAI Er V.K. Agdnihotri, president of the national IITR alumni association, Er J.P. Shukla, vice-president of the association and Er M.L. Sood, the oldest alumnus of the institute. The meet, aimed at strengthening the framework for productive interaction among the alumni, saw the participation from the US, Australia, UAE., Nepal and other parts of the world. The course material will be developed into interactive multimedia materials on CD ROMs for distance learners. These materials can also be used as online resources on the web, said a release issued by the IGNOU. The workshop scheduled from January 3–19 is being organised by the Distance Education Council and Inter University Consortium. Imam Sayeed Ahmed Bukhari called on Lieutenant-Governor B.L. Joshi today at Raj Niwas and drew his attention to the razing of religious structures in Yamuna Pushta. The Lieutenant-Governor gave a patient hearing to Imam Bukhari and assured him that a proper action would be taken in the matter. In an attempt to contribute their mite for the victims of tsunami, students of the Delhi University’s Kothari Hostel have raised money. The hostellers have collected aid from the university area and are contributing Rs 30,000 to the relief funds, including the Prime Minister’s Relief Fund. The students pointed out that “even a beggar volunteered to contribute Rs 2 when he heard about the disaster”. Mrs Sindhushree Khullar, Chairperson of the NDMC, laid the foundation stone for development of the Food Plaza at Yashwant Place, Chanakyapuri. There are 30 shops of 11.15 square metre each and the total height of the shop is nine feet. Extending the new year greetings, Mrs Khullar said that the NDMC is the heart of the country. It has a pride to serve the people coming from all over the world. Yashwant Place is also frequently visited by the foreigners and popularly known as Momo Market. After development, it will attract more customers. She urged the shopkeepers to keep their surroundings neat and clean and set an example of Bhagidari with the civic body. While elsewhere in the city, people celebrated New Year’s Eve on a solemn note, Punjabi singer Mika had the gathering on its feet with his brilliant performance.